Will Valentine Day Overlap the Hot Twitter Trend of iPad? What is the Hot Twitter Trend right now? This days from search engine to various social media platforms such as Twitter trending with one hot topic and that is Apple Tablet or iPad. When Michael Jackson died social media gone wild. Till date the name Michael Jackson still rocking the twittersphere. 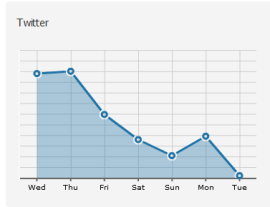 It has been found that, daily on an average 8,699 (as per Viralheat) tweets on Michael Jackson still on the row. It is a common practice that Hot News or Hot Trend persists till another hot topic crunch its place. But, the trend of Michael Jackson on Twitter does diminishes all the myth of Hot News or Hot Trends persistency from the above graph. Looking at statistics of Apple iPad we can guess what will be the scenario of its trend after 2 weeks. Within few week we will face another hot trend over twittersphere and that is Valentine Day. But, now there is a question, will the Valentine Day Overlap the todays Hot Twitter Trend of iPad? I think not! Because Valentine Day is a one day celebration of human love, since Apples iPad has created a long-term relationship with us. I am convinced that Valentine Day will create a big impact over social media this year. The day since Google started indexing Twitter tweets on their search results social media has seen big facelift.